Crazy Lucky – the “hit single”. When I saw this stated on the album cover I had to laugh out loud because apparently I’m not sure what definition of “hit single” is these days. Anyhow, this is a silly and fun, listenable tune. Gonna Get Better – the serious song; a story of a struggling friend. 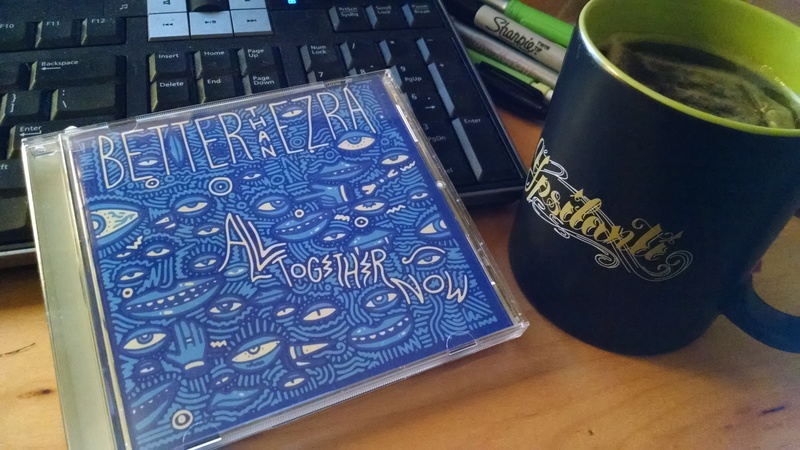 There are usually just one or two serious songs on a Better Than Ezra album dealing with substance abuse, strained relationships, etc… so there you go. This one is very traditional BTE with great vocals, and driving rock-style guitar and drums beneath. Undeniable – see comments on Least Favorite Song in the full review. I have not yet felt compelled to make myself listen to the whole thing. Insane – again one of my least favorites. Not as bad as #3; but really that’s all I have to say. Sunflowers – this actually was my favorite! A fun song that will get you rockin’ in the driver’s seat – refer to my comments for favorite song above. The Great Unknown – this is my very close “second favorite”. The heartfelt chorus will have you singing along, and feeling connected to your freest self. Still fun but thoughtful at the same time. Before You – this is a beautiful song. Simple lyrics, thoughtful vocal harmonies, and piano accompaniment. There is usually one of these on every BTE album, if you are a BTE fan I would compare this to “Under You”, “Everything in 2s”, and “Daylight”, etc… First-dance-at-a-wedding material. You will be singing along before it is over! Dollar $ign – This might be good enough lighthearted fun, but I find the literal “dollar sign character “$” in the title and the cheesy lyrics a little annoying. One Heart Beating – This was kind of a surprise, because I found the overall style and call-and-response approach to the chorus for this to be reminiscent of Coldplay. It would probably be great to hear live, in a huge arena with tons of people singing along. Diamond in my Pocket – This is old skool BTE. Imagine sitting around with your friends and a crappy guitar just playing fun songs in a kind of raw way. Lots of New Orleans references in here too, which is very BTE. A little bit silly of course, but not bad, not bad at all. I Fly Away – This one has sort of a Celtic feel – imagine that you’re running through the hills of the highlands chanting the chorus. In this case, the chorus of “Hey ma mama, away-o” is actually another music history reference to “Life in a Northern Town” by Dream Academy. I like it. Don’t forget to check out the overall album review! Going forward, I’ll include these links at the bottom of each review. Thanks for the input to make this blog better! In the past, if you typed “Better Than Ezra” into Pandora, it would mention “similar” artists such as the New Radicals, the GooGoo Dolls, and (shudder) MatchBox 20. I’m assuming this was just what was also popular in the mid-90s, as opposed to a true alignment of style, quality, and musicianship. Currently, I would say that BTE is closer kin to bands such as the Killers, the Neon Trees, and even Mika, than to anything involving Rob Thomas. After listening to the newest album, “All Together Now”about 4-5 times, “Sunflowers” is my favorite track. Usually I prefer the slow, melancholy BTE ballads, but this dance-y, driving tune has just enough rock and a touch of silliness to be fun. It makes me think of something popular by Jet, with a little White Stripes and / or Beck-ish vocal effects thrown in. I especially love how the opening line borrows lyrical styling from Elvis Costello’s “Watching the Detectives”. I have to mention “The Great Unknown” as my very close “second favorite” song, because it includes a shout-out to Tom Petty (“Oh my my, oh hell yes”) and it really is the kind of song that makes you envision a road trip “Out West” in an old car with the windows down, bare feet, nothing serious going on… that feeling that EVERYBODY craves and will never truly forget. I guess I would describe this as a “cowboy-ish quality”. The title reminds of me of “The Great Beyond” by REM, but otherwise there is no resemblance. My least favorite song on the album? It’s a tie between “Undeniable” and “Insane.” I actually never listened to “Undeniable” in its entirety, because I felt compelled to skip it just a few seconds in, every single time. “Insane” is almost equally ridiculous, but if you ignore the lyrics at least the music is tolerable. BTE is my favorite band. I decided this back in 1997 after seeing them perform in Detroit, and I never looked back. I love their sound; I love Kevin Griffin’s voice and the well-planned lyrics. Even though I’m a little biased, I think pretty much anybody would enjoy this CD if they picked it up. 1) BTE is talented: This is a well-produced album that features the main band members but also plenty of additional instrumentation and featured vocalists that make it sound really lush. I think Kevin has a perfect voice for the lighthearted punky songs, but he also sounds beautiful on the slower, more sensitive pieces. 2) The music is smart: The lyrics are catchy, and often deeper than you first realize. Upon the first listen I noted three or four nods to other songs and / or artists (including Tom Petty, Elvis Costello, and Dream Academy). For me, this type of referencing enhances my overall experience and opinion of the band. 3) This album is totally fine: I stand by my assertion that people will enjoy this; almost every song is better than something you’d catch while browsing radio stations. The whole thing is catchy, upbeat, not too deep and not too pretentious, while being fun to listen to and great to sing-along with. My overall rating: 8.5 out of 10. It gets an A-minus grade for me, because I’m gonna like it anyhow since I always love BTE. Probably B-plus for everybody else. I hope you enjoy the album and my first review on rockmycommute; leave your comments below with suggestions for future reviews, and I’ll enter you in the drawing for my copy of this CD!